In the Taoist mythology of China, the Xian are a group of eight immortal characters who travel the universe together in a state of perfect health and happiness. 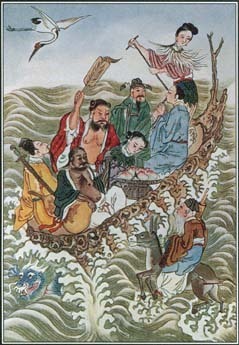 The Eight Immortals are often seen in a group; they appear here in a boat crossing the sea. Zhang Guolao achieved immortality simply by never dying or by appearing alive again after people saw him die. In art he is shown with a peach—a symbol of immortality—and a feather from the legendary phoenix.